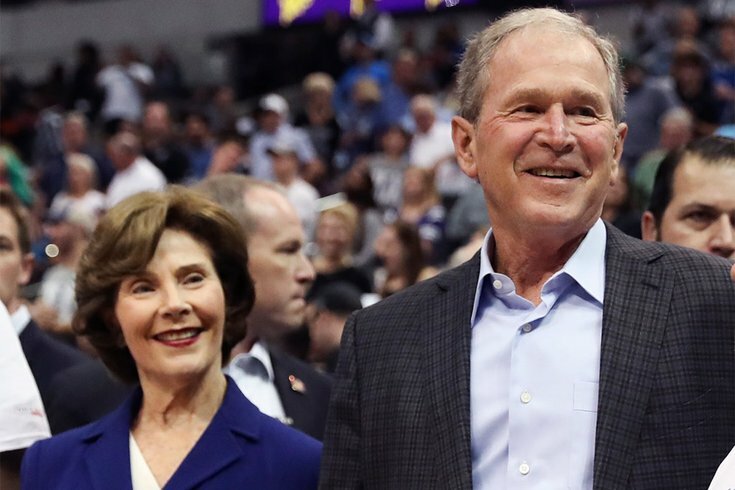 Former President George W. Bush and former first lady Laura Bush will be honored for their work with veterans in next month in Philadelphia. Former Vice President Joe Biden is headed to Philadelphia next month to present the Liberty Medal to former President George W. Bush and former first lady Laura Bush. This year marks the 30th anniversary of the Liberty Medal Ceremony, who in recent years has recognized Muhammad Ali, Hillary Clinton, Malala Yousafzai, the 14th Dalai Lama and John McCain. The Bushes are this year's medal recipients for their work with the Military Service Initiative, a project within the George W. Bush Presidential Center in Dallas. The initiative works to help post-9/11 veterans return to civilian life, including through an employment partnership with the U.S. Chamber of Commerce. The award has been administered by the National Constitution Center since 2006, when former Presidents George H.W. Bush and Bill Clinton were honored for their humanitarian efforts following natural disasters in Southeast Asia and the Gulf Coast. Biden also appeared at the ceremony to honor McCain in 2017. This year's Liberty Medal Ceremony is scheduled for Veterans Day on November 11 at 5 p.m.